When his argument fell to pieces defending his presidential client, advocate Gcina Malindi needed time to collect his thoughts. So he came up with a brilliant ploy. He burst into tears. GUSHWELL F BROOKS casts a dry, almost censorial eye over the first day’s proceedings at the High Court. Courtrooms are exciting arenas for drama. People’s lives are permanently decided on and occasionally, at least in American courtrooms, an accused jumps up, launches an ill-fated escape attempt, just to be subdued with the electrifying stopping power of a Taser. South Africa, as always, punches way above its weight and now advocate Gcina Malindi surpassed this performance with an Oscar clincher of his own - he actually shed real, salty tears. As a former competitive debater, I can assure you with some authority that theatrics is deployed in the absence of substantial argument. As President Jacob Zuma’s advocate, Malindi surely realised this was the case when he had to make a number of concessions and had to go through the gruelling scrutiny of the judges. Legal representatives have a very difficult job: they represent a client and should under law and ethics put forward argumentation in accordance to what their clients instruct. It is particularly difficult when you are Malindi and your client not only occupies the highest office in the land, but he insists that you should pull the race card because someone painted him with an inconveniently open fly. Malindi conceded that the right to dignity and privacy does not accrue to the office of the president and thus had to present Zuma as an ordinary, red-blooded human being, equal a everyone else under law. Now the case is being treated in the way it would be dealt with if my privates were displayed all over Murray’s canvass. Now that his client was recognised as a mere mortal and he needed time to re-strategise and collect his thoughts, he reached up his sleeve and unexpectedly pulled a second race card by claiming that painful memories of apartheid brought him to tears. News cameras were there to capture the action and the judges called for an adjournment so that the sensitive lawyer could collect himself. The judges subsequently ruled that footage of the advocate’s breakdown could no longer be repeated by any South African broadcaster. A furious Gwede Mantashe rallied the crowd outside the court, after the adjournment and, interestingly, conceded that the case will most likely be lost in court – talk about confidence in your race-based case – but they will win it on the streets. The “who’s who” of government and the ruling party started throwing about a word as yet only used by the opposition. Censorship, they cried. Now the argument being put forward by the camp which feels that Murray’s painting should be destroyed and apologised for is claiming that the courts are censoring them. Hang on, is that not exactly what the Goodman Gallery, Brett Murray and the rest of rational, civil society are accusing them of? The slippery slope of poor argument is astounding and it is rather insulting to expect us to lap it up. 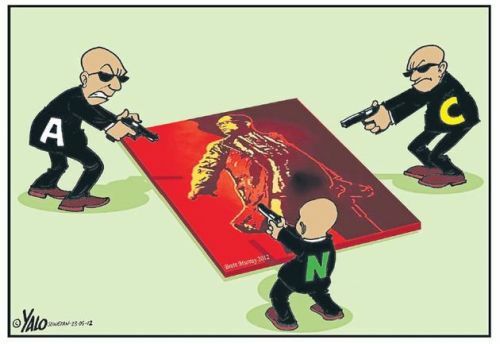 We have heard that our president’s culture, dignity and privacy has been violated by the painting, and then we are told that it is an affront to all black people and the president’s children were supposedly traumatised, now we have a sobbing lawyer and censored government. The judges were not concerned with gossip, our amusement with seeing Malindi cry or the entertainment value and accompanying rise in ratings for a particular news broadcaster. The judges know that there is a court that extends beyond the ambit of their benches. It is a court that bases its decisions and rulings on the testimony of television and newspapers. It is a popular court, presided over by you and me, the court of public opinion. An already emotive issue will be exacerbated by the repetition of Malindi’s sobbing. The court should and wishes to maintain its authority as the decision maker in matters of this nature and here the judges of the South Gauteng High Court want to ensure that they alone make the decision on the issue. Presiders of the court of public opinion have not acquired the sophisticated ability to remain emotionally unfettered by the events that unfold in court. Trained and experienced judicial judges are persuaded by facts, evidence and argumentation, whereas we are easily persuaded by the side that sheds a tear first. The courts know this and, despite the public gallery being extended to our living rooms, they wish to assert their authority by ensuring that we do not question their decision due to the repeated imagery of a crying lawyer. Calling this censorship is as disingenuous as claims that all black men are united in their belief that the display of the contents of the president’s open fly is racist. Some of us actually get the point Murray so explicitly conveys: he shocks us provocatively and by means of a medium of expression overtly protected by our Constitution. Malindi’s expression of pure manipulation is tragically not protected by said document. It was not artistic, instead it was manipulative with the aim to garner lay support and give us yet further reason to lose faith in our judiciary. Mantashe, I believe, deserves to be censored. An organ of state, no more and no less equal to his executive office deserves his and the nation’s joint respect. A statement that the war in court can be lost but will be won in the streets is irresponsible and symptomatic of a greater ill. Understandably, the executive feels sore over the many decisions that have gone south for them in the courts, but they need to set an example in abiding by the decisions of the courts. If the executive and the legislature Mantashe and his colleagues occupy fail to abide by the rulings of the judiciary, then how are we to? The option of appeal or seeking alternative legal remedies is still open to them and this should be sought if they feel that the South Gauteng High Court is incorrect in its finding. An appeal and the request for it should be based in compelling legal reasoning and, unfortunately, will not be granted through tears. Poor legal argumentation, based in the convenient red herring of race, has been diverted with tears. More disturbingly, ordinary people have been rallied as cannon fodder to protest a court ruling that will in all likelihood go against Zuma and his entourage yet again. The courts have been further disrespected by the fact that this complex and monumental issue of freedom of expression has been dragged into the uninformed rulings of the court of public opinion. Malindi’s tearful stunt and Mantashe’s claim that this is censorship to prevent the further dissemination of the event through televised media is nothing more than to exert public, misguided sympathy with the president.